This is a little photo-journal of the silk reeling process as I do it. I've raised silkworms for three years now, and this is how you go about getting the cocoons turned into thread. *NOTE* - This has been a definite learning experience for me. This page shows my original method; I've adopted some quicker and more efficient ways of doing things, which you can see here. This is most of the basic setup. There are two crockpots, one for pre-heating and one for the cocoons that are being reeled; there are forks and slotted spoons, there is a reel (from the 1850's, we're guessing) and a ball winder, and lots of cocoons. The work surface is covered first with plastic bags, because the cocoons drip, and then with towels. Silk will get *everywhere*, and if you don't have something like a towel handy to wipe your fingers on, it's almost impossible to get free of it. I begin by simmering the cocoons in the hot water. They need to get pretty drenched, but they don't need to boil at all. We call this "Pupa Soup." It smells like dead bugs, because, well, dead bugs. Once the cocoons have loosened up a little, and maybe you've held them under the water with the spoon until they stop fizzing, then you can start the Quest for the One True Thread. Each cocoon is made from one thread. The trick is finding it. You start with the toothbrush, which is like taking apart a ball of yarn with a serving fork. You separate out a lot of dead ends, and then you hopefully find the Right One. In the process of finding the right end, you waste a lot of silk. It's OK, because it isn't stuff you can reel anyway; it's short bits from where the cocoon was just getting started. Keep this, though - you can degum it and use it to spin with. This is where silk noil comes from. You can see the waste from two cocoons; some produce more than others. I take it off by wrapping it in a figure-eight shape around my index and ring fingers, while holding the cocoon in the other hand. When you are about to the One True Thread, it will look much like this. I still have one or two extras here - but once you get the One True Thread, the cocoon tends to unravel, and won't pose for the picture. Chris is intrigued with the Pupa Soup, and decides to give it a try. The Pupa Soup is not delicious. Here, if you look *really* close, you can see the individual threads coming off all the cocoons. I'm holding them up. You can check to see which cocoons are connected to the reel, by pulling the bundle of threads to one side... I call this "herding" the cocoons. The ones that are detached will just float, the ones that are attached will follow the threads. These are the cocoons, just about to start reeling. I ended up switching pots later on, though, so don't be confused if you notice it changing. The threads showed up nicer against the dark green, so I used this one for the pictures. Notice the stand, and the little bone button hanging over the pot - this will help to condense the multiple cocoon threads into a single filament - reeled silk! Closeup of the button. You can see where it's tied onto the Bunsen-burner stand with a twist-tie, and the other hole has the threads going through it.Then, I attach the thread to the reel, and begin reeling the cocoons. The blur in the middle is the reel turning quickly. The left hand rocks back and forth, guiding the thread onto the reel. It's important to move that hand so that the wet thread doesn't get deposited on top of more wet thread. Here you can see the reel with some of the silk on it. If your cocoons do this a lot, they probably haven't soaked in the hot water quite long enough. Hold them under with a fork until they get a little water-logged, and that should do the trick. They won't sink, but they'll half-float, and the water makes them a little heavier. It also helps them unwind. As the reeling progresses, the cocoons become thinner and thinner. You can see the bug inside many of them. When you've reeled all the usable silk from the cocoon, they will either drop off in the water, or fly up the thread, sometimes with a surprising wet splat. This is one that went up the thread. The unusable silk at the center of the cocoon is called the "cradle" - when the cocoon runs out of good thread and the cradle is all that's left, I call that "cradled out." When the silk is all reeled on, it's time to re-reel. Sometimes this goes directly to the ball winder, but I decided to try putting it onto another clock reel first. It seems to help reduce breakage, because of the angles and the winding mechanism.Here is the silk being wound onto a toilet paper tube. After enough tubes are made up, they will be reeled together into one thicker thread, then dyed and used for stitchery or weaving. If desired, they can also be twisted using a spinning wheel, a process called "throwing." And voila', there's the silk. This is the pile of noils; it's silk waste and cocoon cradles. You can use this in spinning, or add it to your handmade soap (in the lye water). This is what's left of the cocoons. I take the pupae out and discard them. They can be composted, and are useful as fertilizer.They're an important source of protein for many countries, though. As Chris pointed out earlier, they are not delicious to the tastes of most Westerners. I have eaten one, just to check. Really. Tastes like bug. If you don't raise them yourself, I wouldn't recommend eating them - they will be even less tasty if they're not fresh. If you want to read more about silkworms as food, you can click here. 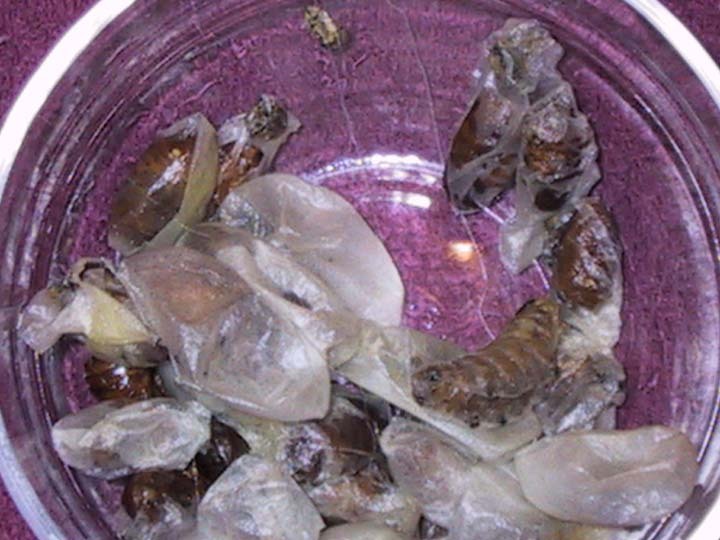 If you want to learn more about the rearing and handling of the silkworms themselves, check out my rearing page.